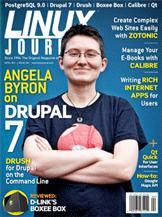 An interview with Angela Byron, co-maintainer of Drupal 7. It makes life easier for those of us who spend some of our working hours hacking away at the command prompt. Surprisingly, the language of the browser is powerful, easy to use and well-suited to high-performance server-side programming—when done right. It's easy to use and open source. With the right tools, you can build rich apps that work with, not against, the user. Qt Quick is transforming user interfaces. Organize your e-book collection before it gets (even more) out of control.